My performance for tuning of the hall. Concert on the 500,000th Steinway, Inaugural tour 1st stop Indianapolis. JANESE TRUVER - PIANIST & KEYBOARD ARTIST * Great American Songbook - Jazz and Pop Standards. *Big Band, Romantic Ballads, Broadway. * 1950's & '60's Rock & Roll. *Wedding Music - Classical and Contemporary. * Dinner Jazz mellow background music. meet the demands of anyone who might engage her to entertain at a function." I sent a review directly to Janese. She's great to work with and provided lovely background music through dinner and helped us with a Christmas sing along. Janese is absolutely fantastic!!! She added a sophistication to the evening, and everyone was impressed with her talent and abilities. Anyone who requires the services of a professional piano player/artist should look no further that Janese Truver. Well worth the money!!! Janese played all the favorite Christmas music. Janese was very professional and right on key. Janese provided the perfect musical selection for our brunch wedding! She was always very pleasant to work with, and she went above and beyond for my husband and I. Janese took the time to meet with me in person to work out the details of our event. When communicating with her, Janese was always professional and timely. I would definitely recommend Janese to anyone who is looking for a keyboardist! Impressive music. A wonderful addition to any event. Janese has played several times at my request for events at a local non-profit. Recently, she played for a large fundraiser lasting over 3 hours with hundreds in attendance. Her sound added a lovely background to the event and many of the guests commented on how nice it was. Her music isalways so pleasant with just the right sound! At other events she has played Christmas music for seniors who just raved about the sound. I highly recommend Janese for any event. In addition to her great music, she is a lovely person and so easy to work with. She listens to your wants and gives you just what you asked for! Janese provided a wonderful relaxing experience during our Holiday Party. I would refer her on to anyone to use and look forward to having her again! Wonderful! Just what I wanted! Professional, on time, beautiful music! Just what I wanted! Classic timeless selections. A genuine smile and attitude. A great selection for our event! Jane's was the perfect Additiin to our event! We hope to have opportunities in the future to work with her again! Janese was fantastic!! She was so nice and very easy to collaborate with. I have some musical schooling and she was very easy to commuicate with as far as what I wanted to sound like, where I wanted cuts, etc. We met a few times before my wedding because I was going to sing to my husband and she was going to play for me. She was so incredibly helpful with the song choice and the rehearsals always went well. We went through the song more than a few times until we were both comfortable with our selection. She played while guests were being seated, and I got a lot of compliments about her and her music! She was very professional with everything! The song I sang turned out better than I was hoping, even though I was crying! I would absolutely use her again for any future pianist needs I may have. Janese, thank you so much for making my wedding day that much more special and beautiful!!! Janese was wonderful to work with! She added an elegance to my daughter's wedding ceremony that would not have been with just a DJ. She was eager to learn new songs that my daughter wanted played. We asked Janese to play for the cocktail hour and received a lot of positive comments! We will definitely hire Janese again and encourage anyone looking for a pianist to contact her. I took a listen to profile this girl is very talented in fact I would like to hire her for a professional concert band. She would definitely be professional enough to do the job hire her for your next event. Janese Truver is amazing - such talent! My mother and I hired Janese to play during my wedding ceremony in July. This was actually my first time hiring a live musician and she definitely put me at ease - I couldn't be any happier with the outcome! From the moment we contacted her and throughout the experience, Janese was extremely professional, prompt, and responsive to contact prior to the wedding. Janese was even willing to learn new songs, attend our rehearsal and travel to our venue. After long months of wedding planning, Janese truly gave my ceremony an elegant feel and we can't thank her enough for creating the ambiance we were looking for. Our wedding guests are still telling us how much they enjoyed her music. If we are ever in need of a pianist in the future, I will be hiring Janese again. I am confident to recommend her to anyone. If you are looking for that special touch to any occasion: hire Janese - you won't be disappointed! Janese performed a small, informal concert to help celebrate my mom's 69th birthday. My mom suffers from Alzheimers and has always enjoyed music. Janese played some of my mom's favorite tunes and church hymns. It was a truly beautiful concert and I believe Janese's performance gave my mom a moment of joy...truly a blessing. Thank you, Janese. Janese is the real deal when it come to the Great American Songbook. Her skills are matched only by her outstanding attitude of service in support of all the gigs I engaged her for. Guests always comment on how pleasant the music is and how they were transported to another time and place. Always a pleasure to work with Janese and "her crew". I have hired her many times with no end in sight! From the first time I contacted Janese, she expressed a desire to make my daughter's wedding a success. She listens, suggests, guides and truly cares. Her talent to take any song and modify it to suit our style, the venue, my daughter's personality was beyond our expectations. We had a large wedding party, and her ability to "go with the flow" during the ceremony was such a relief. Our day was perfect, and even more so because of Janese's talent. She's an amazing find, extremely professional, and a gifted and kind person. What a blessing! My husband and I sought out Janese's musical talent for our Christmas party last year (2014). From the planning to the actual performance, she was professional, thoughtful, and a pleasure to work with. Classically trained...she is! Our guest really enjoyed the live music. I would recommend her to my friends and family. One last notable, Janese's 'no fuss' process allows you to focus on your event and not wordy contracts. She is simply a talented musician anyone would enjoy working with! I hosted a couples bridal shower for a friend and Janese did a wonderful job. We had so many compliments on the music. She was incredibly professional and played beautifully (without any sheet music). We were very impressed and would definitely use her again. My children wanted to help celebrate my 70th birthday in style. They searched and found a wonderful personality just right for entertaining guests in the home. Janese Truver proved to be everything we had hoped. She answered many questions and arrived with equipment to fill our evening with laughter and love. Janese played her keyboard with expertise and professionalism, yet could smile and talk with guests as they passed by her. A very warm atmosphere surrounded our home and her music was sent through the surround sound on all floors. We truly found a jewel that evening, she made the holiday open house birthday just wonderful. We both are pianists, and when we were planning our wedding, it was especially important to find someone that could really dazzle. I asked my piano teacher from high school for a recommendation, and she gave me Janese's contact information. Janese is a truly exceptional pianist and extraordinarily versatile. As long as she can hear the melody, practically anything is within reach! If we could do it all over again, we would definitely ask her to play for our wedding. Janese is an extremely friendly and nice person. From the moment that we e-mailed her, she responded right away to discuss what were looking for. She was always there to help with any questions we had and always responded to our e-mails quickly when it got close to the wedding. She is very talented and made our wedding ceremony beautiful! She was very prepared and met with us to talk about and plan the music that we wanted and played some samples for us to hear. She met with my sister, who was singing a solo, to practice and make sure that it was perfect for our wedding day. She played all of our songs that we requested and we loved her! She really helped out with all of our song ideas, as well, if we were unsure with what would be best for the exit, when the guests were walking in, etc. We are so glad that we picked Janese to be a part of our special day and would definitely recommend her to anyone! Her expertise, communication, and professionalism are all reasons that we would recommend her. Janese was the pianist at our wedding and she was marvelous! The music during the ceremony was beautiful and magical! Also, during cocktail hour Janese played big band era music. It was so much fun! Janese did a wonderful job at setting the mood for both our ceremony and cocktail hour. We wanted everyone to feel a certain "emotion" and Janese helped us achieve that goal. It inspired me to want to learn to play the piano again! Thanks Janese, our wedding would not have been a fabulous event without you! Janese Truver was one of the musicians selected to play at the 2014 Carmel International Arts Festival. She is truly a professional, very pleasant to work with and gave a great performance! Words will never be able to express the gratitude we feel toward Janese for being part of a perfect wedding day for my daughter and son-in-law. She did an excellent job in guiding us with ceremony music that beautifully complimented the elegant wedding that we had dreamed of. We could not have found a better pianist anywhere!!! Janese created a pleasant and relaxed atmosphere for our guests before and after the wedding with her fantastic renditions of Big Band Era music. The whole day from beginning to end was magical and we will be eternally grateful to Janese for her part in making this day perfect. Thank you Janese...we love you!!! I create all my keyboard musical arrangements. YES! People ask if I'm playing the guitar, vibes, trumpet! Everything you hear I am playing "LIVE in the moment," not to pre-recorded or karaoke sound tracks. My music is created for YOUR event! You decide the ambience or theme - I will create the music appropriate for the occasion and help set the mood. My state of the art sound system will accomodate any size event or it can be patched into your wireless equipment. I started piano lessons in my hometown of Munster, IN, studied classical organ and piano at the American Conservatory of Music, Chicago, IL and later at Indiana University, Bloomington, IN. I was a church organist and taught piano for twenty years. I've entertained for all types of local and national special events. Recent highlights include the U.S. 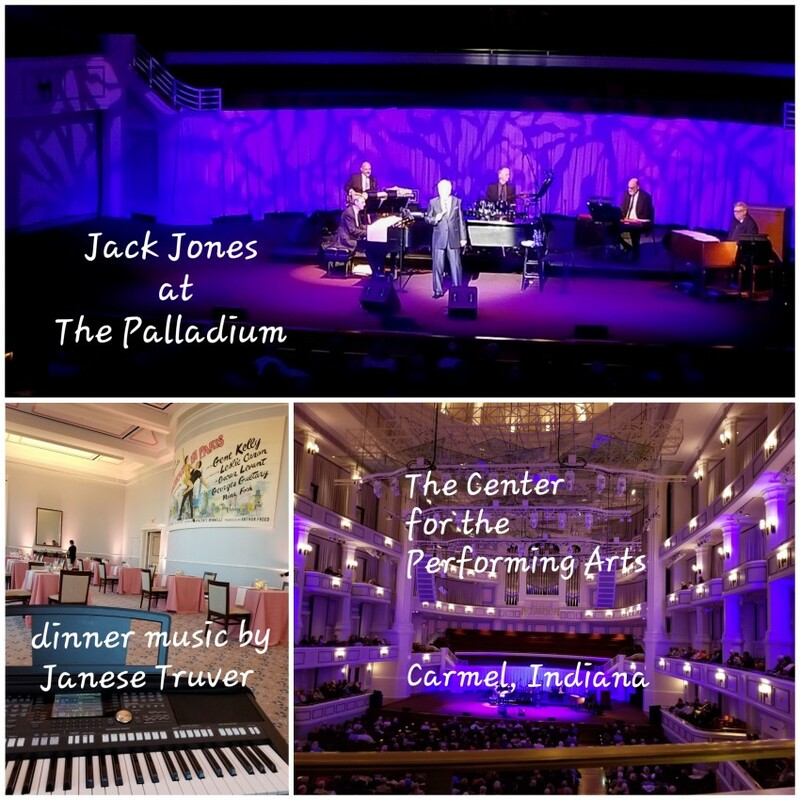 Mayors Conference held in Indianapolis, The Governor's Arts Awards, Grand Openings and Galas at The Palladium, Booth Tarkington Civic Theatre & Studio Theatre at The Center for The Performing Arts in Carmel, IN, V.I.P. Party for Michael Feinstein and David Hyde Pierce. Other notables include Indianapolis 500 Press Parties, Indianapolis Dream Homes and many, many more. I've played with orchestras, jazz bands, accompanied vocalists for special events/concerts and for musicals including "Swingtime Canteen" and "It's a Wonderful Life." *When the inaugural world-wide tour of the beautiful 500,000th Steinway piano made it's stop in Indianapolis, I gave three solo concerts, played private events hosted by Steinway and made a video documentary of the historic instrument with local Indianapolis TV and celebrity columnist, Reid Duffy. Marvin Hamlisch played a concert that evening on the piano. Michael Buble, Ella Fitzgerald, Harry Connick Jr, Michael Feinstein, Diana Krall and many others. Big Band, Swing, Broadway, Classic Jazz/Pop/ & Oldies. Electrical outlet and space for 2 speakers and keyboard. I have been to many events where Janese is providing the entertainment. Absolutely great every time! I would hire Janese to play over and over again. Janese Truver is a terrific pianist and entertainer. Her repertoire is broad and she is able to meet the demands of anyone who might engage her to entertain at a function. In addition to her musical talent, Janese is a terrific woman. Her integrity and reliability, coupled with a wonderful personality means that she will never disappoint an employer. Janese is an amazing pianist! She did great work for our special events and I would highly recommend her for others. "Janese is prompt, dependable, pleasant, polished, plays like an angel and is so elegant at all times. I have had the pleasure of working with Janese for years and she's always on the top of my list of preferred musicians. My clients are always so complimentary as well - which is always my goal!" Janese, Thank you for helping make Carla & Kelly's wedding beautiful and special! We really appreciated and enjoyed your music!! "Thank you for the lovely music you played at the wedding! I will recommend you for sure!" "Janese, Thank you for being the pianist for our wedding. The music was wonderful! Keep sharing your talent!" "Thank you so much for your beautiful music and for helping to make this occasion so special!" "Janese, I cannot say thank you enough for playing at our wedding. It was beautiful and perfect!" "Janese, I had great reviews and the residents want you to come back!" "Thank you! You were wonderful and we've had so many people tell us that!" "Thanks Janese, You were a hit as usual!" "Janese does a fabulous job. You will not be disappointed. What a variety of book she plays, for all ages. Everyone loves her and she is such an addition to any event." "Janese was a true professional, she arrived early, set up...and played the entire time! She was a joy and delight and complemented my parents 50th wedding anniversary beautifully. As a professional musician myself, I appreciated her talent level and piano proficiency, her ample artistry and her generous musical gifts, all of which were employed during the afternoon she entertained us. I felt completely comfortable with her the entire time and never had to worry that anything would be missed or less than perfect. Thank you, Janese! You were TERRIFIC!!!!" "Janese is that rare pianist who plays with emotion and feeling. The perfect choice for any occasion, be it cocktail hour, a black tie affair, beautiful dinner music or as the main entertainment. Janese's talent and personality shine thru."